The Solitary Sandpiper is found in Tennessee during spring and fall migration, and as both the common and scientific names imply, it is usually found foraging along the banks of ponds and creeks alone. It breeds in the northern boreal forest of Canada and Alaska (where it nests in trees using the nests of other birds! ), and winters from Mexico to southern South America, but also on rare occasions in Tennessee. The Solitary Sandpiper is most likely to found in the state from mid-March to early June, and again from early July through November. Description: This medium-sized shorebird has a moderately long bill, neck, and legs. It has a bold white eye-ring, a dark olive back with scattered small white spots, and a distinctly barred tail. The rump and central tail feathers are dark, and it frequently bobs its head. Voice: Flight call is a clear, high, rising whistle peet-WEET or pee tweet weet. Spotted Sandpiper uses the same habitat, but constantly bobs its tail, is slightly smaller, has a white eyestripe, a less prominent white eye-ring, lacks white spotting on the back, and has a wing-stripe in flight. Lesser Yellowlegs has long, bright yellow legs, a white rump, and a mostly white tail. Habitat: In migration and in winter, it is found along freshwater ponds, stream edges, temporary pools, flooded ditches and fields, more commonly in wooded regions, less frequently on mudflats and open marshes. 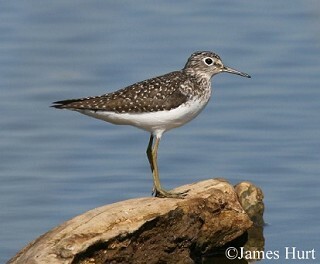 Nesting and reproduction: The Solitary Sandpiper has never been documented nesting in Tennessee. Status in Tennessee: Uncommon migrant, but regularly found in suitable habitat during spring and fall migration. In spring it may be found between mid-March and early June and in fall from early July through November. Very rare in winter. Although ornithologist Alexander Wilson first described the Solitary Sandpiper in 1813, its nest was not discovered until 1903. Until that time, eggs and young of the Spotted Sandpiper were misidentified as those of the Solitary Sandpiper. Of the world's 85 sandpiper species worldwide, only the Solitary Sandpiper and the Green Sandpiper of Eurasia routinely lay their eggs in nests in trees instead of on the ground. The Solitary Sandpiper uses the nests of several different songbirds for its own nest, including the American Robin, Rusty Blackbird, Eastern Kingbird, Gray Jay, and Cedar Waxwing. When a Solitary Sandpiper lands, it holds its wings straight up over its back and then slowly closes them. 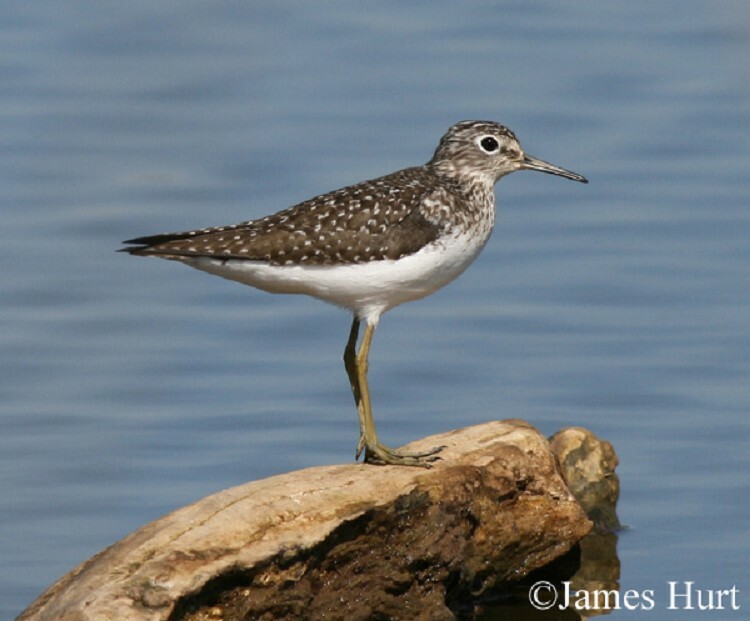 Less is known about the Solitary Sandpiper compared to other North American shorebirds because of its remote breeding habitat and its tendency to migrate alone or in small flocks. Best places to see in Tennessee: Many of the traditional shorebird locations are likely to turn up Solitary Sandpipers, including Ensley Bottoms, Rankin WMA, Tennessee NWR units, and various places around Reelfoot Lake. Moskoff, W. 1995. Solitary Sandpiper (Tringa solitaria), The Birds of North America Online (A. Poole, Ed.). Ithaca: Cornell Lab of Ornithology.